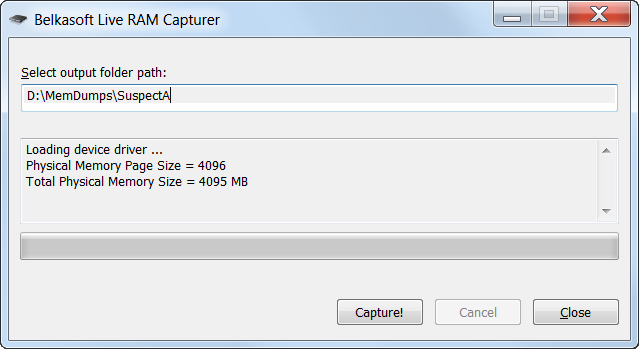 Belkasoft RAM Capturer is a kernel-mode tool designed to capture the content of the computer's volatile memory in a forensically sound way. Developed by a forensic research company, Belkasoft RAM Capturer requires no installation and leaves as small a footprint as theoretically possible. Coming with 32-bit and 64-bit kernel-mode drivers, Belkasoft RAM Capturer is able to overcome most current anti-debugging and anti-dumping protection systems such as nProtect GameGuard. Unlike many other memory dumping tools operating strictly in user mode, Belkasoft RAM Capturer works in the system's most privileged kernel mode, being able to acquire the full content of the computer's RAM. Certain applications, including multi-player computer games, communication tools, and malware implement anti-debugging measures to actively block third-party tools from accessing their memory sets. In mild, best-case scenarios these proactive measures will simply cause the memory dumping tool to read zeroes (or random data) instead of the actual information. In other cases (e.g. malware, Trojans, certain security applications), such systems may lock up or reset the PC, thus destroying the content of the volatile memory and making it absolutely impossible to dump RAM contents. Examples of such anti-debugging systems include nProtect GameGuard and the game of Karos. Many forensic RAM acquisition tools will operate in the least privileged user mode, triggering these protection systems and serving no good to their users. Unlike many competing tools running in system's user mode, Belkasoft RAM Capturer comes equipped with 32-bit and 64-bit kernel drivers allowing the tool to operate in the most privileged kernel mode. Belkasoft RAM Capturer leaves the smallest footprint possible, does not require installation and can be launched in seconds from a USB flash drive. Memory dumps acquired with Belkasoft RAM Capturer can be then analyzed with Belkasoft Evidence Center Live RAM Analysis.